If you are looking for a St George excavator to get some dirt work done then Creative Excavating is your place to be. We have extensive experience in the business, what needs to be done and how it needs to be done. We look forward to hearing from you to hear about what excavating jobs you have. Here’s a list of the equipment that we have available at our hands to help with your excavation needs. The 305 is our mini-ex, it gives you flexibility and usability at the same time. It’s a workhorse that has the ability to get into tight spaces, but still has the power to move a lot of dirt. It’s been designed to deliver exceptional performance providing optimum versatility and productivity. It has a spacious cab with a sliding door provides easy entry and exit in confined job sites. It’s also simple to service it as it has a tilt-up engine access enclosure. 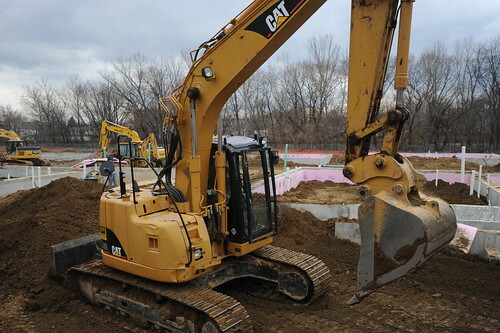 Our 320 trackhoe is one of our biggest work horses. When you have a lot of stubborn dirt that needs to be moved then the 320 is your excavator. The cat 3066 engine and hydraulics gives our tackhoe exceptional power, efficiency and control-ability for unparalleled industry efficiency. It’s designed to reduce unwanted vibration and sound that can be distracting on the job site. The hydraulics of it are masterful with snubbers and cushion shocks that reduce the sound and increase the life of your cylinders. The control-ability and operation of it has been expanded, and the automatic engine speed control with it’s one-touch command system makes being in control of it easier than ever. If you have a lot of soil to move and have the ability to access it then our loader is a dream machine. It can move a lot of dirt, quickly. It’s powered by huge diesel engives that give it all the power it needs to get the job done. The cab controls are easy to use and offer us the ability not have to spend our time worrying about the machine and how it’s holding up, to worrying about getting your St George excavator job done quickly. And last but not least our skid steer offers you the ability to get into incredibly tight spaces where the big tractors just can’t go. So if you need some finish dirt work around the back of your house, or if you’re packing dirt around the side, then that’s what we use our skid steer for. We have a lot of experience with these skid steers, as theirs a right way and a wrong way to operate them. And there’s a good way and a better way as well. We can get the job done, but we can also get it done faster.